Transferred from the Royal United Services Institution, 1963. No. 7519. The blade is probably 17th century. It has been converted from a double to a single edged blade, and has three short fullers and a short ricasso. The hilt has a cross guard with straight, flaring bronze quillons, a cynindrical grip punched and engraved with a diaper pattern, and a horizontal disc pommel covered with silver. 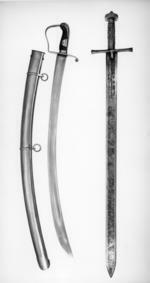 The scabbard is of tooled reddish brown leather with a broad, leaf-shaped end and a silver chape. It has two loops of crocodile skin holding the iron loops for the elaborated but incomplete baldrick. 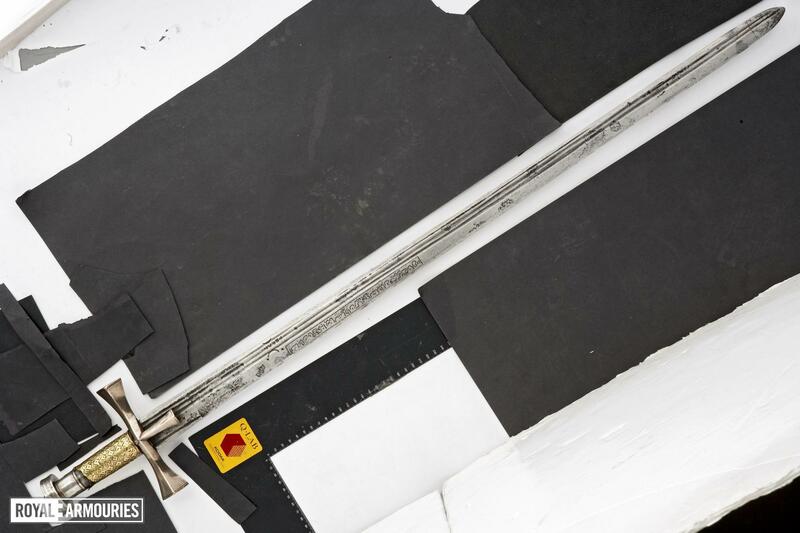 Dimensions: The length of the blade is 880 mm, the length of the hilt is 115 mm and the width across the quillons is 150 mm. Weight: The weight of the sword is 1.2 kg. Etched on the blade 'al-sultan `Ali Dinar ibn al-sultan Zakariya ibn al-sultan Muhammad 1316' (Sultan `Ali Dinar son of sultan Zakariya son of sultan Muhammad al-Fadl 1898/9); ' ? al-saif li `Abd al-Rahman ibn al-sultan `Ali Dinar ibn al-sultan Zakariya 1327' (this sword was transferred to `Abd al-Rahman son of the sultan `Ali Dinar son of sultan Zakariya 1909/10'. Engraved on the quillon terminal 'al-sultan `Ali Dinar ibn al-sultan Zakariya 1326' (sultan `Ali Dinar son of sultan Zakariya 1908/9). Stamped FERRAR between sickle marks. L. Kalus, 'Inscriptions arabes et persanes sur les armes musulmanes de la Tour de Londres', Gladius, XV, 1980, pp. 65-7. The scabbard is currently XXVIS.262.